Stocks posted significant gains for the second straight week last week. Both the S&P 500 (SNPINDEX: ^GSPC) and the Dow Jones Industrial Average (DJINDICES: ^DJI) gained roughly 3%. The boost contributed to an epic start to 2019. 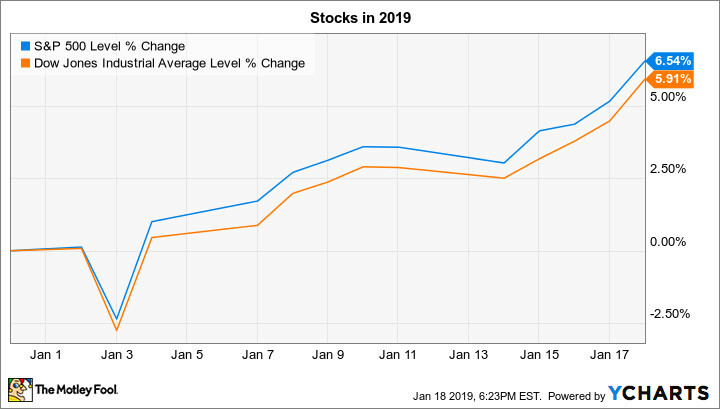 As you can see below, major stock indexes have climbed 6% in less than three weeks. 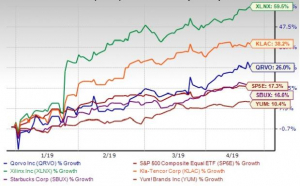 Earnings season marches on over the next few days, and reports from Johnson & Johnson (NYSE: JNJ), Procter & Gamble (NYSE: PG), and Starbucks (NASDAQ: SBUX) could send these stocks moving in the trading week ahead. Johnson & Johnson investors are hoping the stock will recover from its recent slump when the healthcare titan posts fourth-quarter results on Tuesday. Shares fell 12% last month, and while the decline was driven by general market weakness, Johnson & Johnson was also hit with bad press regarding its safety protocols. In December, it was reported that the company may have ignored health risks in some of its consumer talc products -- CEO Alex Gorsky and his executive team might mention this -- but it's not clear whether the issue will lead to significant legal expenses for the market leader. In the meantime, investors will be focused on the latest global trends in Johnson & Johnson's pharmaceutical business, which has been growing at a robust pace in recent quarters, and its consumer segment, which is still looking to establish a healthy expansion rate. The company will also issue key updates on Tuesday about how its various drugs are moving through the approval pipeline, along with fresh statistics regarding recent intellectual property purchases. Procter & Gamble shareholders are looking forward to the company's earnings report on Wednesday morning. That's because P&G's last announcement was headlined by some of the best growth that the consumer giant has posted in years. Organic sales expanded by 4% on healthy volume to outpace rival Kimberly Clark by a wide margin. That company, whose Huggies diaper brand competes with Procter & Gamble's Pampers franchise, also posts its results on Wednesday. P&G's report will show whether the company passed along higher prices to consumers, since it rolled out price hikes across its portfolio over the last few months. If shoppers responded by shifting toward value-based brands, then sales growth likely fell back down toward the 1% rate from the past fiscal year. If not, then P&G will be in a great position to accelerate sales growth in fiscal 2019 to 3% and meet management's annual forecast for the first time in three years. Coffee giant Starbucks will announce its fiscal first-quarter results on Thursday afternoon. Investors are hoping the chain can rebound from the weak growth it has managed lately in its two biggest markets, the U.S. and China. After missing global growth forecasts in the previous two quarters due to struggles in these areas, Starbucks met management's targets in its most recent report. Another quarter of improving traffic trends would be evidence of gathering momentum in the business. 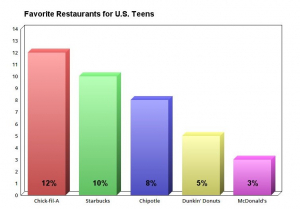 However, Starbucks will have to work hard to win market share in the ultracompetitive restaurant industry. 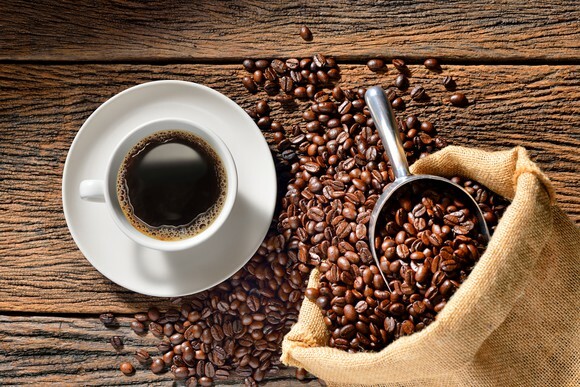 Rival Dunkin' Brands just rolled out its new espresso-based offerings this past quarter, and McDonald's stepped up efforts to extend its dominance in the breakfast hours. With the industry growing slowly overall right now, success by one of these competitors can only come at the expense of the others. Demitrios Kalogeropoulos owns shares of McDonald's and Starbucks. The Motley Fool owns shares of and recommends Starbucks. 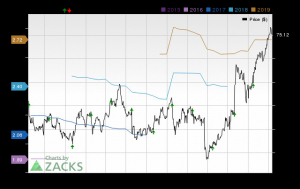 The Motley Fool owns shares of Johnson & Johnson and has the following options: short January 2019 $140 calls on Johnson & Johnson. The Motley Fool recommends Dunkin' Brands Group. The Motley Fool has a disclosure policy.